Action: Challenge the world to develop a full scale undersea laboratory capable of housing up to 100 persons 24/7 year round. It would be placed in relatively shallow water (<100 ft) with satellite stations at intermediate (>1000 ft) and deep depths (>3000 ft). Don't be timid, write your local, state, and federal politicians today. Consider: We all know about the wonderful developments in technology that were generated by the race to the moon and subsequent research at NASA and other space programs. Imagine the technologies that could be developed if a serious attempt were made to establish a real undersea research base! Action: Promote transfer of undersea technology developed for the �Ocean base� to provide new jobs and grow the economy. What About Windfarms and Other Offshore Development? Consider: This begs the question of how are we to avoid further destruction of our fragile ocean ecosystems? Already we have thousands of offshore oil platforms, undersea cables, dumping grounds, etc. In recent years there has been heated debate over the merits of establishing offshore windfarms. In the next few years I expect we will see an explosion of proposals for offshore wind, tidal and wave energy projects. Why keep our heads in the sand? We know that some of these developments will take place eventually. Lets develop the guidelines for prudent use of our resources NOW before its too late. And when these developments are approved, lets insure that industry mitigates their impacts by requiring mandatory research and monitoring components. Take for example, the proposed windfarm development off the coast of Cape Cod, Massachusetts. If only 1% of the construction cost were allocated to supporting research, that would provide over 8 million dollars in funds. We should also require these companies to provide the infrastructure and equipment needed by marine scientists. Currently, scientists at the Woods Hole Oceanographic Institute and various other regional and national institutions spend considerable research dollars to establish offshore observatories for the collection of oceanographic data. A large chunk of the funds are spent on the platform and data transmission infrastructure. 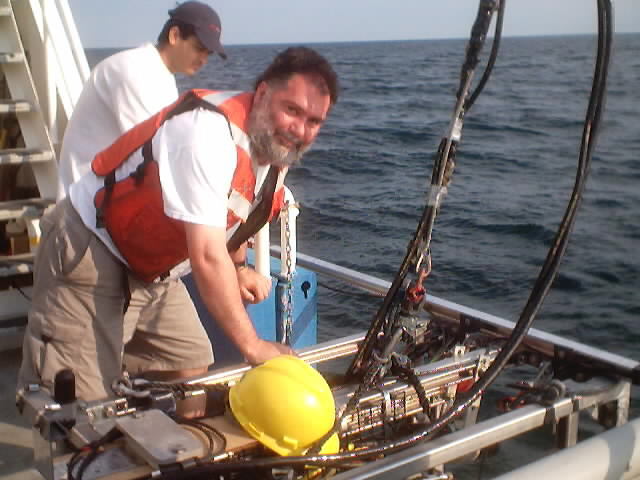 As a result, only a small number of offshore observatories have been established to date (e.g., the Leo-15 and Martha's Vineyard sites, see http://www.whoi.edu/coastalresearch/res ... tgers.html). However, this one windfarm project, could provide a vast, ready-made, infrastructure for undersea research. Imagine, over 100 instrumented platforms providing real-time data free to public schools and colleges, all for one or two percent increase in construction costs. Nothing remotely like that has been done before. It would provide an unprecedented view of underwater life to scientists and the public. Action: Promote ocean stewardship while allowing prudent ocean development and insuring the highest quality science through mandatory research. Contact your local, state and federal politicians and let them know that you want ocean development to give back to the public. A Champion for Undersea Research? Consider: I believe our country, and the world, needs a champion for undersea research in Congress and in the White House. Despite recent government and academic reports that call for increased research on our marine natural resources, funding continues to be cut. Although it may be a cliche, its still true that 75% of the earth�s surface is covered by water, yet we have hardly begun to explore our oceans and have relatively little understanding of their complex ecology. We need a champion in our government who will galvanize undersea research, just as President Kennedy galvanized our space program. Wouldn�t that be an interesting, and different, component of a Presidential campaign platform? Action: Be the Champion. Write your representatives.